It's so easy to subscribe for paid mobile phone services that you might do it without intending to: it just takes one tap on a button on the service's webpage to sign you up. 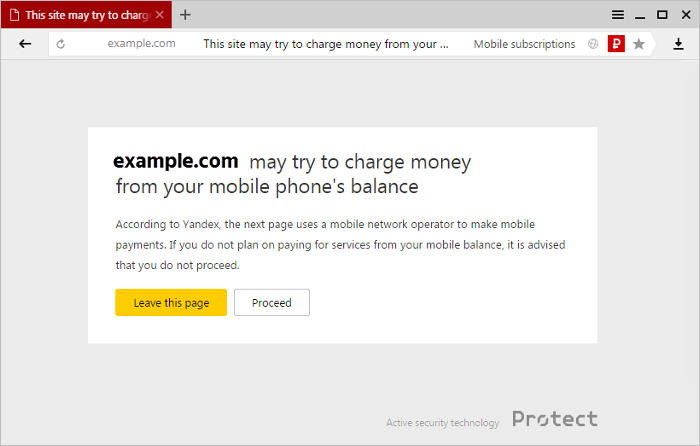 Yandex Browser uses the Protect integrated security system to warn you about paid subscriptions so that you agree to them only when you really need to. Paid subscriptions are one way to pay for online services. For instance, you can use a paid subscription to set up an answering service on your cell phone or sign up for weather forecasts sent by SMS on a weekly basis. To subscribe, you simply follow a link to your mobile service provider's page and tap a button to confirm. Some content providers abuse simple subscription setups and sign users up for services they don’t know they’re paying for. Although mobile subscription pages are hosted on the websites of mobile network operators, their content is determined by outside content providers. Some of these content providers deliberately conceal information about paid services. For example, the payment button might be labeled Play or Login and the message informing you that the service is paid may be written in small letters or hidden beyond the visible part of the screen. By tapping just one button on one of these sites, you can initiate daily withdrawals from your mobile balance. It is particularly easy to end up in this position if you get to such a site using a computer rather than a mobile device. This is because it is harder to notice small letters on a bigger screen. According to Yandex's data, about 20% of users land on pages with a mobile subscription from their computers. One of the reasons for this is the popularity of 3G modems that are often used with Wi-Fi routers. Additionally, malicious extensions may open pages containing paid subscription extensions. If you end up on a mobile service provider's page that contains a paid subscription, Yandex Browser will display a warning in the browser window and you'll see the icon on the left side of the SmartBox. Tap Proceed only if you really intend to pay for a subscription. Attention. If you want to disable warnings about paid subscriptions, you will have to completely disable protection against malware and malicious sites in the browser. We strongly recommend that you don’t do this. Go to the Protect tab at the top of the page. In the Protection from malicious files and websites section, turn off the Check the security of sites and downloads option. 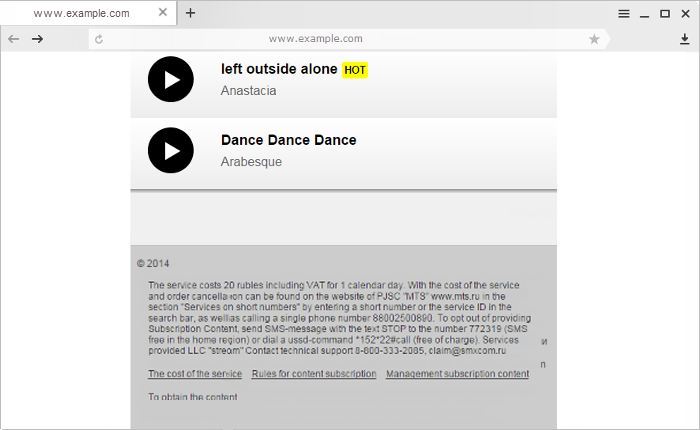 Use the same procedure to re-enable warnings about paid subscriptions.